Kathleen Brandt's executive business background and premier research skills have landed clients from Asia, Australia to the Americas for her successful business, a3Genealogy. Her media clients include NBC and TLC - Who Do You Think You Are?, PBS - Finding Your Roots, and the History Channel - How The States Got Their Shape. How can you do it in 5 years? DNA for Genealogists! 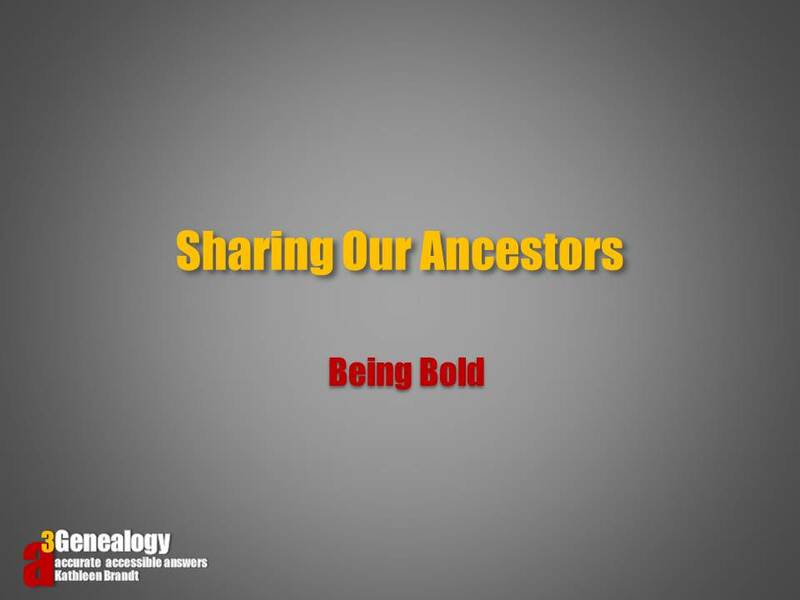 "Calling all cousins - especially those looking for Native American ancestry, African American and Jewish heritage, slave roots, biological kinships, and for those wishing to identify or pinpoint ancestry origin. Oh...and let's not forget those who wish to chart family medical genealogy and those looking for unknown living cousins (forensic genealogy). Your results may shock you, but the science is accurate. 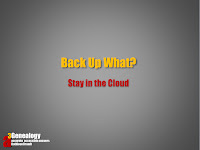 "Don’t leave home without your toys! 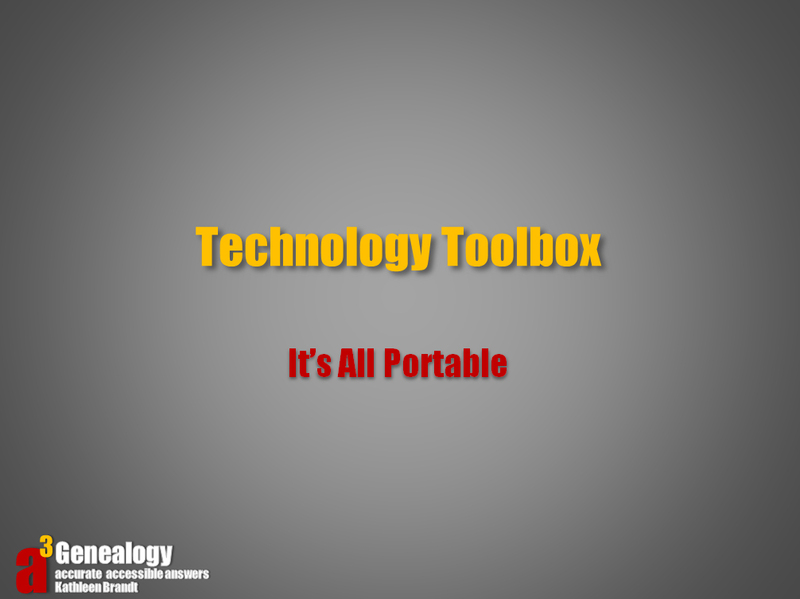 Let’s share a few technology tools to have in order to make your visit to the homestead, cemetery, or library successful." "We don't always have years to research and develop interesting ancestral stories, so the key is to partner your sleuthing skills with effective genealogy research tips to fast forward your research." Based on a successful model to build your ancestors' life stories, Kathleen Brandt of a3Genealogy shares 10 tips to effectively fast forward your genealogy research. She applies these techniques when conducting celebrity and VIP client research. Her research can be seen on NBC TV series Who Do You Think You Are? Appeared on Tim McGraw episode (Season 2) and worked on an upcoming Season 3 episode (2012). 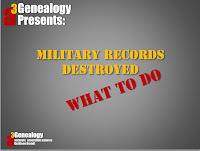 Military Records Were Destroyed? What To Do? 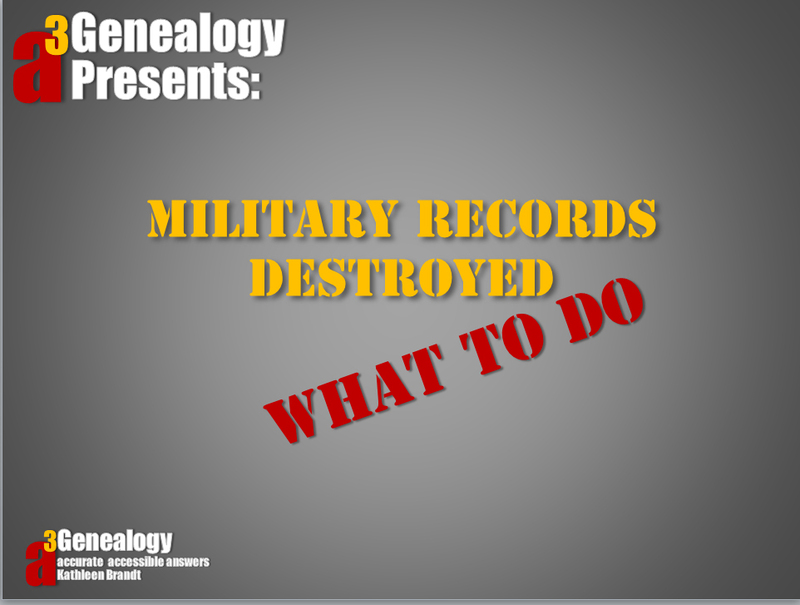 "With a bit of perseverance and legwork family researchers can rebuild an ancestor's military service history even though the July 12, 1973 fire at the St. Louis National Personnel Records Center (NPRC) destroyed between 16 to 18 million military service files, including those for WWI and WWII." This lecture is offered to beginning and intermediate genealogists. "Although pivotal in the history of America, the War of 1812, often called the "Second War for Independence" is mostly forgotten. But understanding this "battle for borders" may guide you to your 1812 Soldier and family. 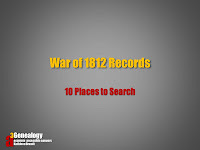 The history of 1812 and 10 tips to researching your 1812 ancestor will be presented." This lecture is offered to beginning to advanced genealogists. 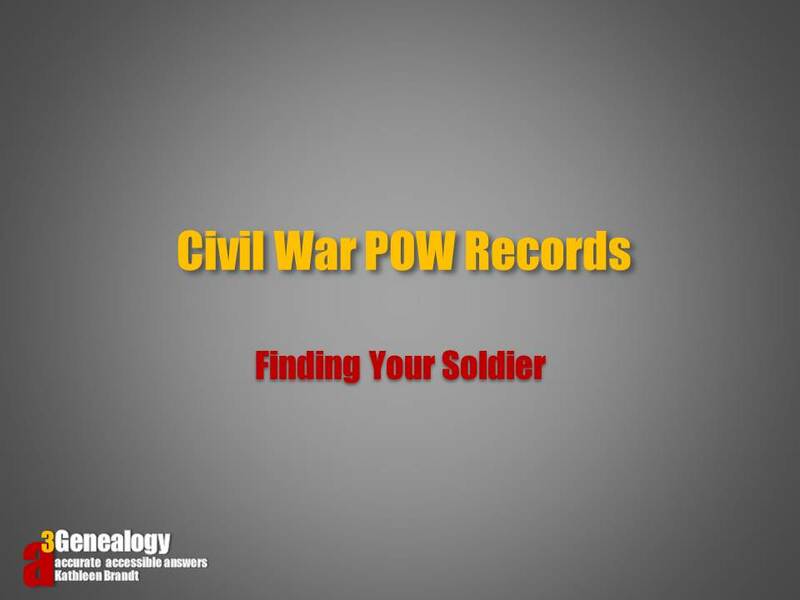 "It's impossible to research the Civil War era, without reviewing POW records. There were more than 160 prisons holding 647,000 prisoners captured during the Civil War. Many were paroled in the field, but 215,000 Confederate soldiers (and citizens) were held in Union prisons; 26,000 died while being held. Of the 195,000 Union soldiers (and citizens) held in Confederate prisons, 30,000 died while imprisoned. 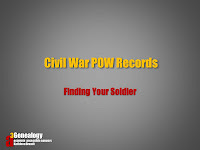 Although some records were destroyed and burials places removed, many records have survived and may be used to locate your Civil War veteran. These records confirm burials, prisoner's exchanges, escapes and more." 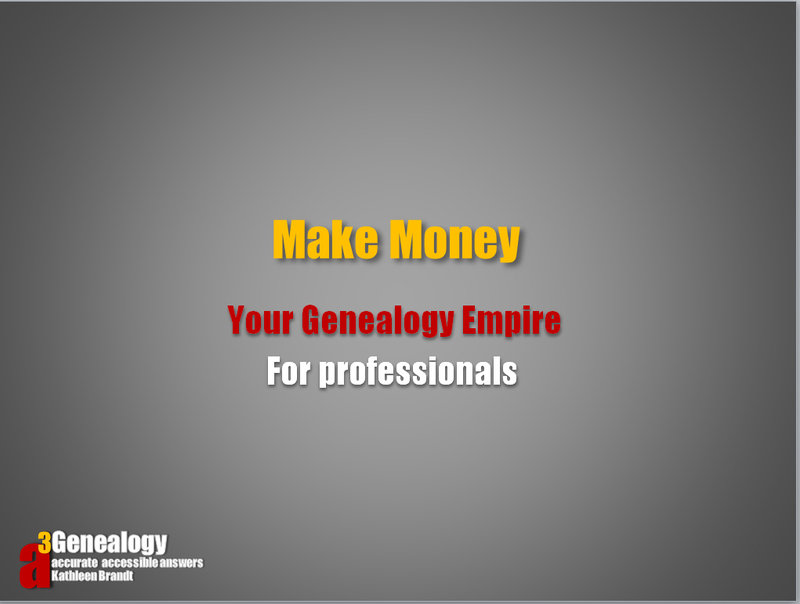 This lecture is offered to beginning to advanced genealogists. "This workshop outlines 5 ways to freedom: indentured servant law, free-born rights, military service promises, purchasing of freedom and use of the underground railroad." 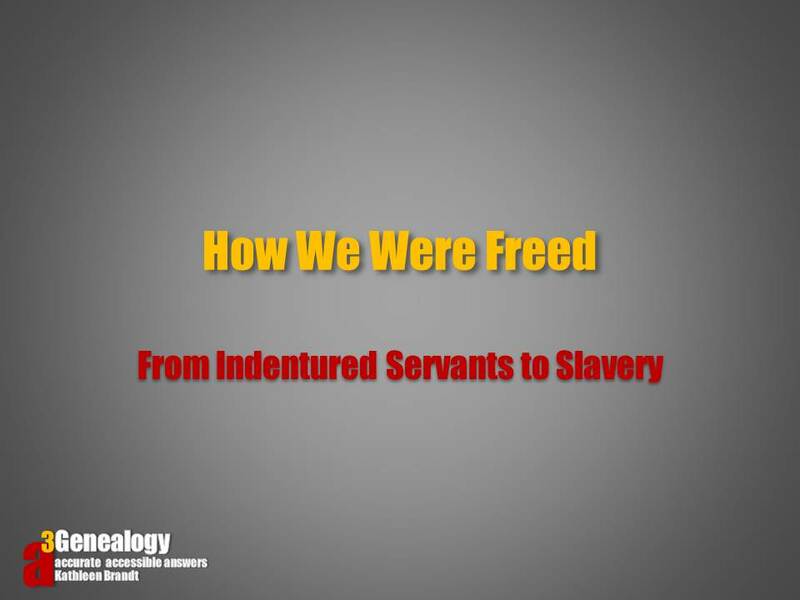 Attendee will be given an introduction to the practices of indentured servants vs. slavery, an overview of the southern free coloreds, an understanding of “who was the slave- owners (to include Native Americans and Free-Coloreds). Various war emancipation documents from Revolutionary to Civil war service and legal documents of purchasing freedom will be shared. 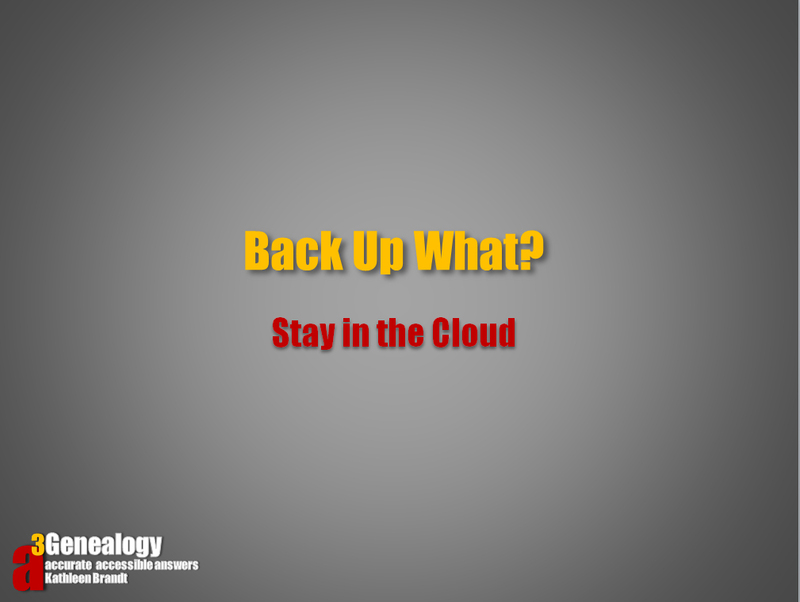 This workshop includes various reproductions of actual documents. This lecture is offered to beginning and intermediate genealogists. 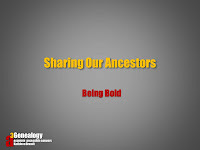 "Let’s keep our ancestors alive through booklets, scrapbooking, storytelling, quilts and more. This workshop offers ten (10) easy ways to share your ancestors to family and friends to keep them wanting to know more. The presenter will share ideas and provide tips to meet every personality. Some ideas are rather unique, but great conversation starters. The goal is to ignite the love of ancestry with others. 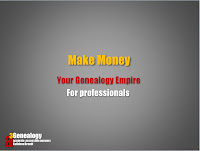 This lecture is offered to beginning to advanced genealogists. Kathleen Brandt is a Professional International Genealogist and Consultant and is a published freelance writer for genealogy magazines and columns. She is also the author of the a3Genealogy.com (http://a3genealogy.blogspot.com) educational and skill building blog that explores various cultural and ethnic folk life, traditions, history, and genealogy research tips. Utilizing twenty years as an international corporate executive and five years of teaching college level Spanish, French and English writing courses, Kathleen offers workshops and lectures to the genealogy community and is a consultant for various corporate historical, cultural, and genealogy projects. As a multilingual speaker, she translates Spanish, French, and Italian records and has experience researching German, Swedish and Hellenic records.